Coverage: Live on BBC Radio Ulster and BBC Radio 5 live, plus live text commentary on the BBC Sport website. 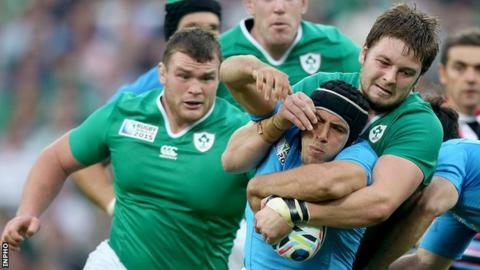 Iain Henderson is a shock absentee from the Ireland starting XV for Sunday's World Cup game against France while Jared Payne is not risked after injury. Henderson, outstanding in recent games, is replaced by Devin Toner at lock while Keith Earls stays at centre as Payne recovers from a bruised foot. Rob Kearney returns at full-back in place of Simon Zebo with Cian Healy preferred to Jack McGrath at prop. France make two changes with Louis Picamoles and Noa Nakaitaci recalled. Number eight Picamoles replaces Bernard le Roux in the back row for the Pool D decider in one of two changes from the 41-18 win over Canada. Coach Philippe Saint-Andre's other change sees Fijian-born wing Nakaitaci taking over from Remy Grosso. Both France and Ireland have won their opening three games in Pool D and the losers of Sunday's match are likely to face New Zealand in the quarter-finals. Henderson's demotion to the replacements is a big call by Ireland coach Joe Schmidt, with the New Zealander believing that six foot 11 inch Toner is needed to disrupt the effectiveness of the France line-out. Yet Henderson's energetic work around the field has probably been the most impressive feature of Ireland's World Cup so far. The Ulsterman was man of the match in last weekend's narrow win over Italy and is certain to come on during the Millennium Stadium contest. Schmidt said the decision to recall Toner had been "a really tight call". "Dev has been a big-match player for us and gives us a little bit more line-out capability," added the Ireland coach. "We (also) do believe that at the back end of the game, Iain will add value." Payne trained fully on Wednesday after missing the Italy game but swelling on his injured foot following that session sealed his fate. With Earls remaining at centre, Tommy Bowe and Dave Kearney retain the wing spots as fit-again Rob Kearney returns at full-back in place of Simon Zebo. Healy is named at loosehead prop after his Leinster team-mate McGrath started in the front row role against Italy. Lions forward Healy started Ireland's second World Cup match against Romania after making his return to action following neck surgery as a replacement in the opening win over Canada. In the France selection, Picamoles' return sees Damien Chouly switching to flanker with experienced skipper Thierry Dusautoir completing a strong back row. France have talked this week of targeting Ireland pivot Johnny Sexton and skipper Dusautoir and number eight Picamoles will be central to that aim. Toulon's powerful centre Mathieu Bastareaud is also likely to be part of France's tactics to disrupt fly-half Sexton. Replacements: Richardt Strauss, Jack McGrath, Nathan White, Iain Henderson, Chris Henry, Eoin Reddan, Ian Madigan, Luke Fitzgerald.